My good friends at Chronicle Books have another fabulous blog tour going. As is usual with the innovative Chronicle, they have a grand idea: a very nifty concept for reluctant readers, The Worst-Case Scenario Ultimate Adventure Novels. And Bob's your Italian Uncle--the reluctant readers will snap it up and beg for more... at least that the hope. I couldn't wait to put this to the test and enlisted my very own reluctant reader, my 9-year-old son K.R. "I really liked how it had you choose how to survive. And my favorite part was the part about the bees. There were some really great drawings. I could really relate with the characters. Being in the Amazon was dangerous, which I liked. It's one of the best books I've read. And I'd really like to read the books about Everest and Mars." I've got a copy of AMAZON to send your way, whether you have a reluctant reader or not. Just leave a comment, extra Brownie points for Tweeting. All you good people should be getting an e-mail in your mail box later today. And please, everyone, put it on your calendar that I'll be reviewing Chronicle Books' The Worst-Case Scenario: Amazon, An Ultimate Adventure Novel next week. I'm part of the blog tour for this book, which is targeted for reluctant readers. 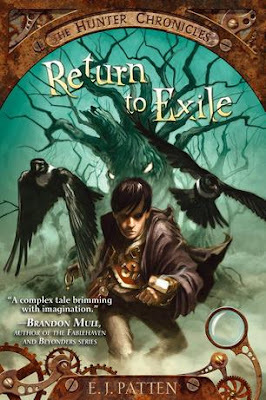 I am incredibly thrilled to be part of the Return to Exile Blog Tour. E.J. Patten's debut, Book One of The Hunter Chronicles, is a rip-roaring read, full of fascinating characters and monsters. The main character's palm has a cicatrice ("trix") which bleeds black blood, for gruesome's sakes!! Eleven years ago, a shattered band of ancient monster hunters captured an unimaginable evil and Phineas T. Pimiscule rescued his nephew, Sky, from the wreckage of that great battle. For eleven years, Sky Weathers has studied traps, puzzles, science, and the secret lore of the Hunters of Legend, believing it all a game. For eleven years, Sky and his family have hidden from dark enemies and moved all over the United States while, unbeknownst to Sky, his uncle Phineas sacrificed everything to protect them. Here's what you do to win: Comment, with your choice of book OR bracelet--as well as choosing a number between 1 and 482. I'll reply with your very own line chosen from that page in the novel. Winners will be announced on Tuesday 24th!! 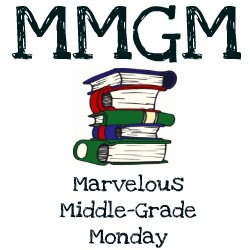 Marvelous Middle Grade Monday: Tua and the Elephant--And a GIVEAWAY! We're ba-aack! Boise (and McCall) were beautiful, and we even had snow for spring break. (Bet you've never seen a dozen mafiosi pelting each other with snowballs.) However, I have missed you all. 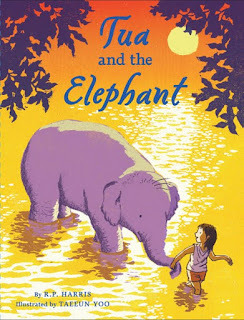 I managed to sneak reading Tua and the Elephant in between my latest addiction, George R.R. Martin's A Song of Fire and Ice--but that's definitely not middle grade, so you won't be hearing my thoughts about it here. Tua, however, is a wonderful middle grade tale. Those of you who follow me closely know that I'm a complete sucker for stories in foreign lands. Thailand's a great place, and Tua's stomping ground is the city of Chiang Mai, which I remember as being very lovely. About the author: R.P. Harris has spent much time in Asia, including three months in Thailand. He divides his time between San Francisco and Shanghai. About the illustrator: Taeeun Yoo has illustrated numerous books for children, including the New York Times Best Illustrated Book, Only a Witch Can Fly. She lives in New York City.